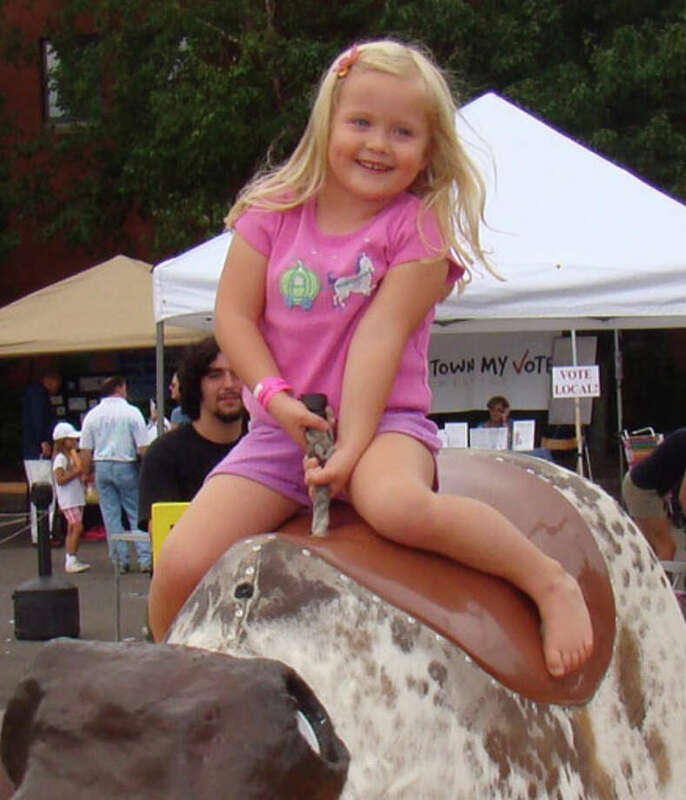 Kids of all ages will have fun riding the bull at the Blues, Views and BBQ Festival taking place Sept. 5 and 6. Hungering for good music and great cuisine? Then get set for a smokin’ hot time over the Labor Day weekend when the annual Blues, Views & BBQ Festival downtown should satisfy both cravings. The 8th annual event, presented by the Westport Downtown Merchants Association, will take place over two days — this Saturday and Sunday — at the Levitt Pavilion for the Performing Arts, as well as the grounds of the Westport Library and the adjacent Imperial Avenue parking lot. The event, which takes place rain or shine, runs from 11 a.m. to 7 p.m. both days. The BBQ competition will take place Saturday at the parking lot, according to Lee DeMonico, marketing and communications director for the WDMA. She said the event is sanctioned by the Kansas City Barbeque Society and most of the competitors are from the area, including a team from the Westport Fire Department. She said the barbecuing starts around 6 a.m., well before the gates open to the public at 11 a.m. The cooks begin turning in their entries — chicken, pork ribs and a chef’s choice — by early afternoon. This year, there will be a People’s Choice judging where anyone can pay $5 to judge wings barbecued by the contestants, she said. Winners in all categories will be announced at 5 p.m., DeMonico said. That event benefits the Westport Woman’s Club’s Food Closet, she added. Twelve bands are booked, she said, to headline a “Levitt Live” lineup performing at the pavilion both days. This includes New Orleans-style funk/rock and soul music Saturday and blues Sunday. “We’re featuring authentic American music,” she said. Performers are scheduled to include Robert Randolph and the Family Band, Joe Louis Walker, Anders Osborne, Matt Schofield and Dumpstaphunk, among others. Organizers created the two-day event to meld the worlds of BBQ and blues, organizers said. Since the festival’s inception, music offerings have branched out to include soul, funk, R&B and rock and roll. The event will also feature “Jesup Jam” on the library grounds and at the Imperial Avenue lot, she said. That will include activities for people of all ages, including cooking demonstrations by local chefs, pie- and rib-eating contests, bouncy amusements, electronic bull riding and children’s attractions, she said. There will also be a barbecue, gourmet and specialty food marketplace and a food court offering wood-fired, grilled and roasted food, craft beers, liquor, wine and other refreshments, DeMonico added. The food court will include Winnie’s Jerk Chicken & Fish, which offers Caribbean cuisine; Bobby Q’s Bodacious BBQ, which cooks up ribs and pulled pork, and the Blue Lemon restaurant, which will offer lobster rolls and tuna tacos, said said. Tickets to Jesup Jam and the Levitt Live events are sold separately. Children 12 years old and under are admitted free. DeMonico said attendees to the Levitt event should “BYOS” — bring your own seats, or a blanket. “No food, drinks or dogs are allowed in the pavilion,” she said.